Lion T Shirts - 3 Strand Cord Silks - Glowing Silk Flags & Billows based on the Bible, Jesus and His Church, to enhance your worship of God! The Daughter of the Lion is also a Lion! Not everyone wants to wave a flag. Some prefer to WEAR theirs! 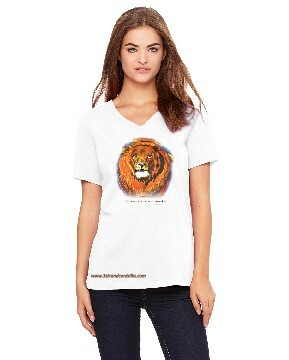 Here's my original art - the LION of JUDAH - on high quality T Shirts. Shirts are V Neck, with a Relaxed fit. Background colors include light pink and white. 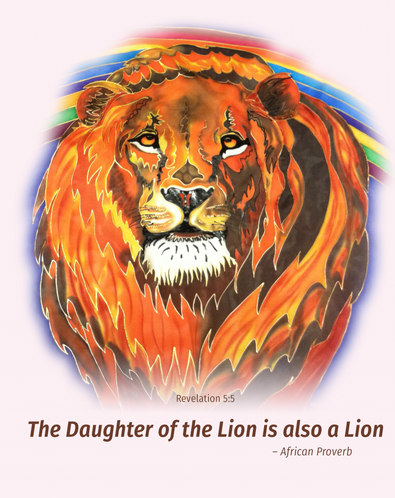 Lion of Judah by Caryn Fenimore - taken from the Lion of Judah/Rainbow of Promise Flag. Now on T Shirts!